I n October, events in San Miguel de Allende definitely slooowww down. The summer season is well and truly over and end-of-year holidays are far off. Folks have more time to just sit on a bench in the autumn sunshine and stare at the changing shades of pink in the Parroquia stones. Or watch the kids chase balloons and each other. Or read the paper between those eyes-closed, basking-in-the-sun moments. Or do nothing much at all. Of course, there is always something interesting going on in San Miguel. For details on what's current, check our Current Activities page (coming soon). Early-October - Festival Internacional Cervantino. The main October event is not in San Miguel at all. The Cervantino Festival in nearby Guanajuato has grown into a world-class celebration of the performance and visual arts, one of the most important in all of Latin America. 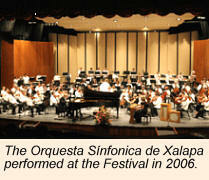 2007 will be the 35th annual edition of the Cervantino. 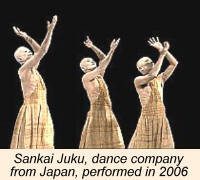 In 2006, some 90 different performing groups and soloists performed over the 19 days of the Festival. Nearly two dozen visual artists exhibited. There's also a film festival and many innovative children's programs. And that's only the official festival line-up. Like the Edinburgh and other international festivals, the Cervantino has developed a "fringe" festival that spills into the streets, exploding with artistic energy and cutting-edge creativity. Vendors of every type of art and craft sell their wares in the twisty lanes of the town. It's a vibrant time to be in Guanajuato. Many of the events and exhibitions also take place out of the city, and several are regularly presented in San Miguel de Allende. If you plan to attend any Cervantino Festival events in Guanajuato, order tickets well in advance. They can be purchased online from Ticketmaster MexicoAlso, arrange your transportation ahead of time. Buses fill up quickly. Parking inside the town is completely impossible. For more information on Cervantino Festival events, visit the Festival Cervantino website. October 12 - Dia de la Raza (Columbus Day). From a Mexican viewpoint, when Christopher Columbus sailed the ocean blue in 1492 and landed in the New World, it was not a good day for the local folks he found here. Mexicans generally refer to the event as "El Encuentro," the Encounter. And the day most of us call Columbus Day is referred to here as "Día de la Raza," Day of the Race. The point is that the fateful meeting between the Old World of Europe and the New World of the Americas was the beginning of the race of Mestizos, those of mixed European and indigenous blood, which makes up a huge majority of the Mexican people. 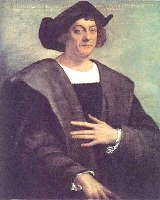 Columbus is also seen as the bringer of genocide and the slave trade and, for many, this is a day of mourning their heritage. A candlelight ceremoney is held at the Plaza de Toros Oriente on Calle Recreo. October 31 - Halloween. Despite the wonderful traditions of Days of the Dead, Mexican children have been quick to adopt the concept of Halloween and Trick or Treat. Expect to see kids running around with small plastic jack-o-lanterns and chiming "Halloween." But they're not looking for candy. It's coins they are hoping to have dropped into the little orange buckets. If you plan to be on the streets or around the Jardín tonight, take along a good supply of 50 centavo and one peso coins. October events in San Miguel de Allende offer a cultural banquet, both in town and out. And a lot more elbow room than the heavily touristed days of the high season.